Traveling this summer? 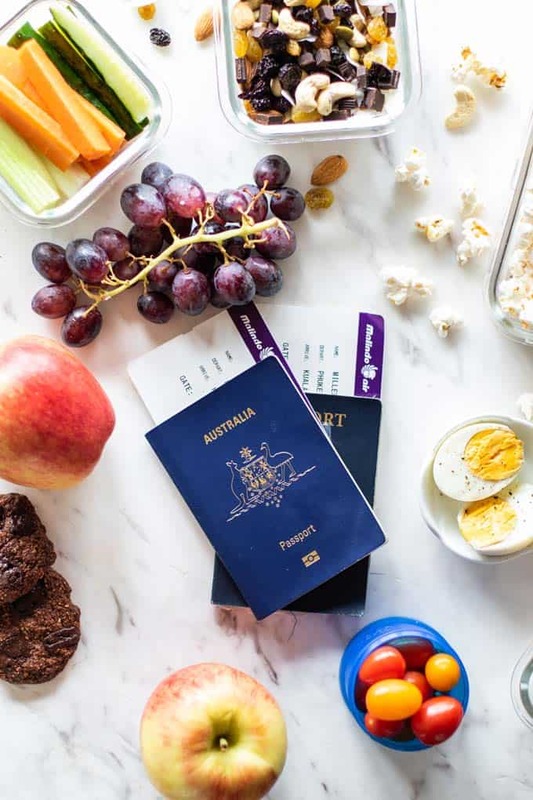 This list of healthy airplane snacks will get you to your destination with a full belly, even blood sugar, and even help you battle jet lag! I travel half way around the globe with my toddler a couple times a year, so taking the time to pack healthy travel food is so important. 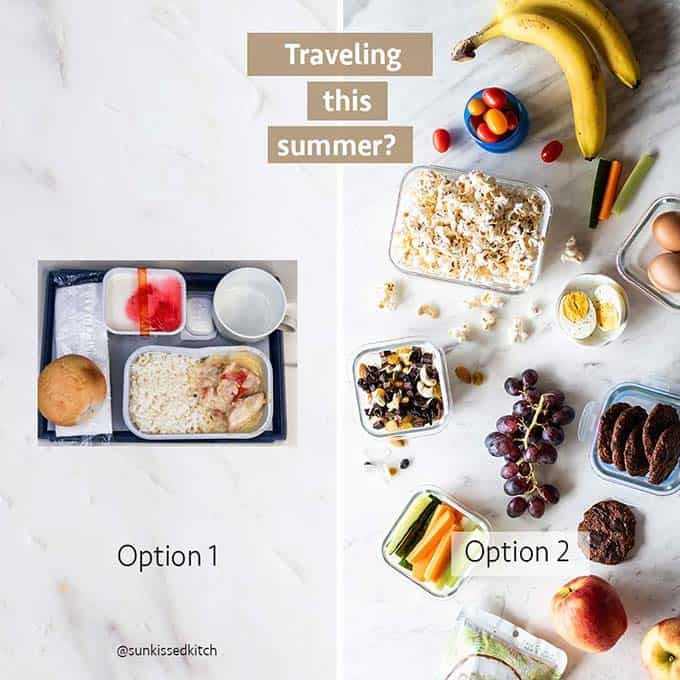 Option 1: Eat carb-heavy airplane meals, and junk food snacks including chips, candy, nuts cooked in vegetable oils, and other processed foods bought from fast food restaurants and convenience stores. 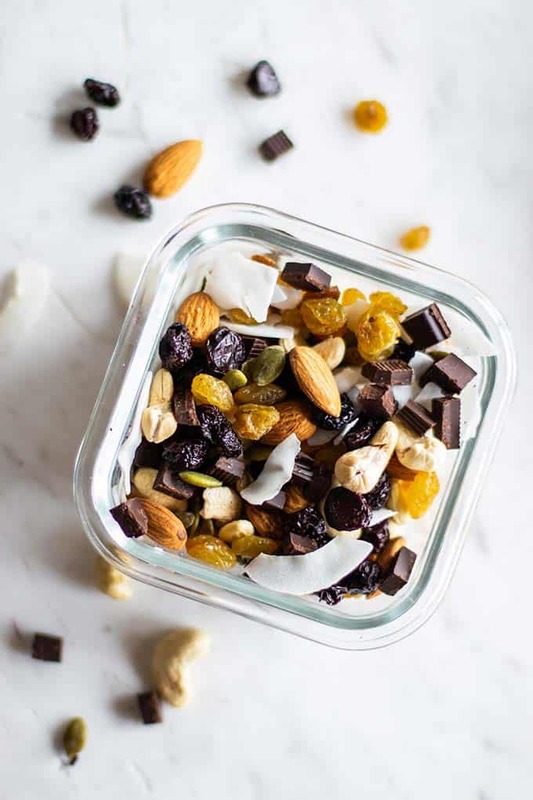 Option 2: Spend 30 minutes the night before traveling to prepare healthy snacks that are rich in nutrients and fiber, free of refined carbs and preservatives, and low in sugar. The first will make the trek even more stressful on the body. A variety of healthy snacks, as presented in option 2, actually has health properties than can lessen the toll travel takes on the body! What Snacks to Take on a Plane? I love to make this on the stove with a bit of coconut oil, and then add sea salt and Italian seasoning. You can also just air pop it in a glass container in the microwave, and then spray with coconut oil, and sprinkle with salt and cinnamon. If you want to get really wild, mix up some of my Everything Bagel Popcorn. Airplane travel includes a lot of waiting time. And what do to with that waiting time? Often, we snack! Best to keep some low calorie, water dense snacks on hand! I love to pack dips, like the tahini dill dressing from this salad. You can’t pack liquid dips like this — unless you’re traveling with kids, and then the rules are waived! A work-around for this is to actually add the dip to your food, so you can pack the veggies with the dip in a jar and it’s fine. It’s just not fine to be in a container on it’s own. 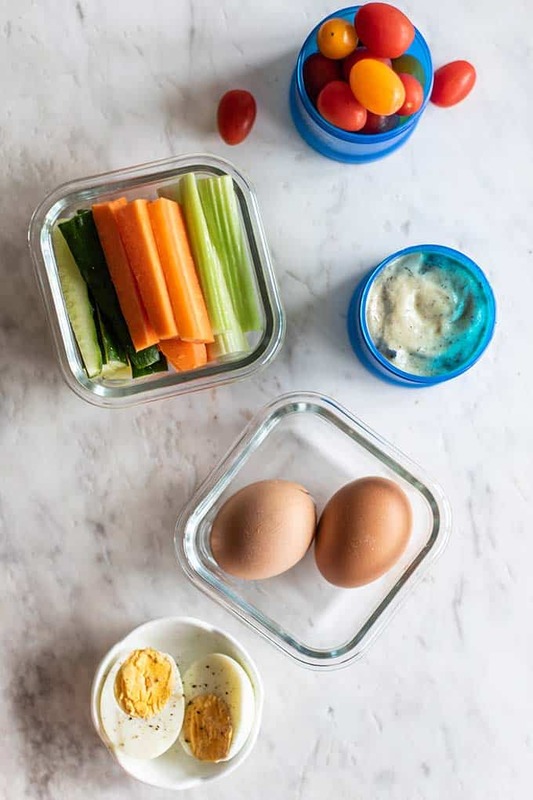 It’s hard to bring protein rich snacks on the plane that don’t also have sugar (like protein bars), but hard boiled eggs travel well at least for the first 4-5 hours. We usually have these for breakfast or morning snack during the first part of the trip, and then switch to protein bars after they are gone. Lots of fruits travel well. I love apples because they can make the whole 24 hour journey and still taste great. 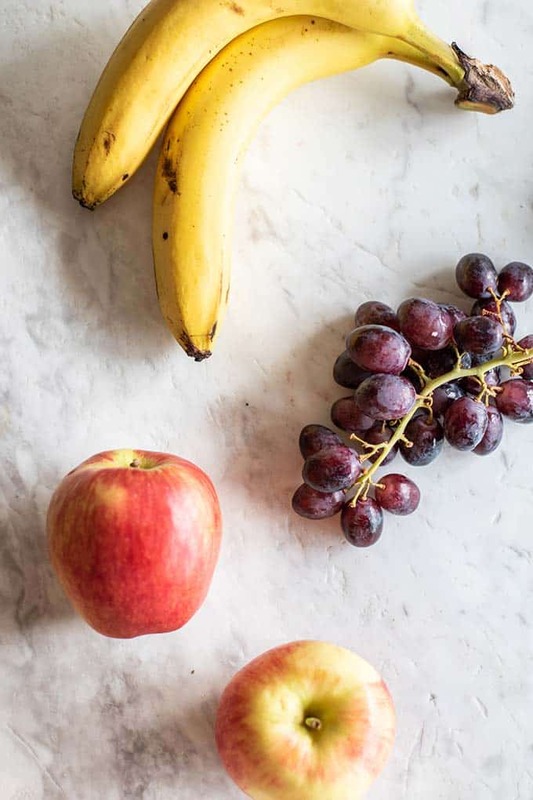 I usually save the apples, and we eat the easier-damaged fruit like bananas and grapes earlier on. Oranges, kiwis packed with little spoons, and berries also often make it on our journeys. One of the best portable airplane snacks snacks ever. Trail mix makes it the long haul, and has belly-filling fiber and healthy fats. I use raw nuts, dried fruit, coconut flakes, and chunks of dark chocolate, for the best treat ever on a plane. This with an apple or carrot sticks is usually my “dinner” later on in our trips, since I pass on the airplane meals! Trail mix is one of the best things to take on an airplane. 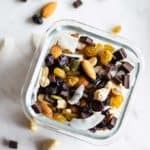 This mix is formulated for long-haul plane travel, where you'll need the boost of fiber, protein and healthy fats, to stay energized and full. This mix also contains dried tart cherries, a natural source of melatonin, known to help combat jet lag. All all ingredients to a travel-safe container. Keep in a cool area to prevent the chocolate from melting. Other options: whole grain cereal, raisins, dried apricots, walnuts, freeze dried peas. If you can find them, include dried tart cherries in your trail mix. Cherries are a natural source of melatonin, and can help lessen the effects of jet lag. The recommendation is to eat a handful of these on your journey (or several, if it’s a long haul flight! ), and then to eat another handful before going to bed each night until you feel you’ve adjusted to the new time zone. 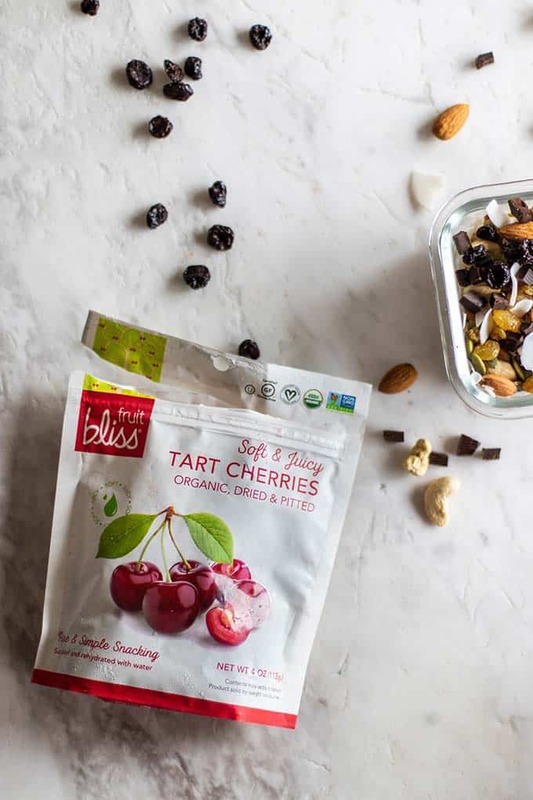 All cherries have melatonin, but dried tart cherries have the most concentrated levels. Look for a brand that doesn’t contain added sugars. 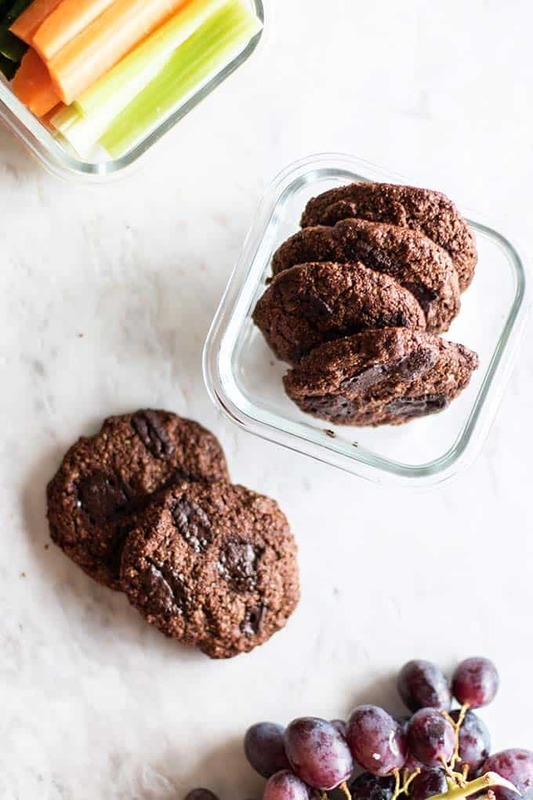 We also love bringing homemade cookies, protein bars, and even pancakes or waffles. If you plan ahead, the suggested snacks below make great travel snacks. 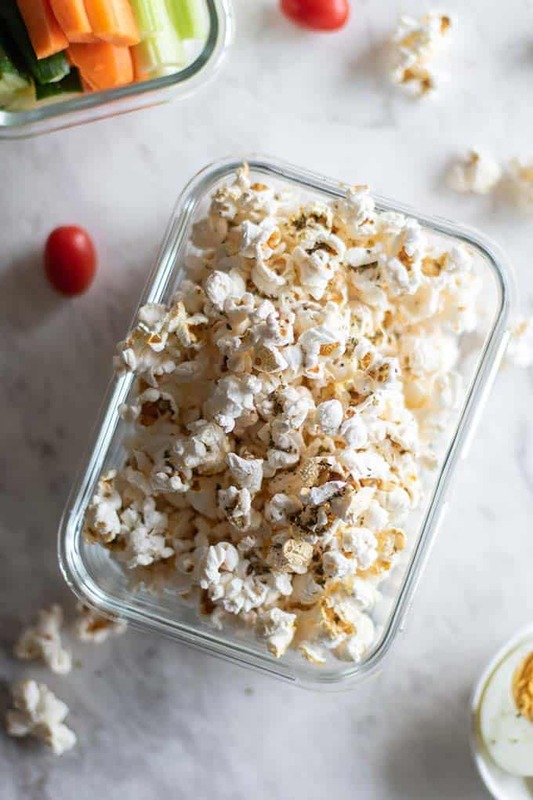 The rest of the items on this list are relatively no-prep, so taking the time to make one special treat, especially for longer flights, will make the trip so much better, plus lessen the urge to stop and buy your kids M&Ms at the convenience store! This Healthy Airplane Snacks post contains affiliate links. This means if you make a purchase, I will receive a small protein of the sale as a commission. This helps me keep Sunkissed Kitchen up and running! Wow! What a great info! I would definitely pick Option 2! Right?! I have gotten lots of practice at packing snacks for airplanes -- having fresh and healthy food makes such a difference and is worth the effort! I always buy food from the grocery store to take with me on the plane if I know I am going to be on it for awhile/during a meal. That way I get excited to go on the plane (LOL)... Because otherwise, I am scared of flying. But say, if I have Whole Foods pre-made grilled salmon waiting for me, all is right with the world, hahaha!